– Millennium Foundation Kosovo (MFK) has signed a Memorandum of Understanding in Des Moines, Iowa, with Des Moines Area Community College (DMACC), to start an exciting program of scholarships for Kosovo women, focused on degrees related to energy sector. Starting from 2019, with the financial support of DMACC as well as private sector actors, first five women will start classes for accredited two-year Associate Degrees in courses such as wind turbine engineering, the energy efficiency of buildings, solar energy and other related fields. Robert Denson, President of DMACC stated: “DMACC is proud of the new partnership with Kosovo Millennium Foundation. We have worked with Kosovo in past but now we are opening a new chapter focusing on the needs of the private sector in Kosovo, as well as creating the new generation of women leaders in the energy sector. Iowa, as nation’s leader in renewable energy, is well positioned to help its Sister State of Kosovo in this respect”. Petrit Selimi, the CEO of MFK has stated: “Today we are opening an exciting new window of opportunities for Kosovo women. With DMACC we are planning to provide scholarships for Kosovar women interested in science, technology and energy. Our plan for the next three years is to provide full scholarships for 20 Kosovars women to study in DMACC and other accredited colleges, to obtain degrees, skills and working experience much needed in Kosovo’s energy landscape. Over 90% of labour working in the energy field in Kosovo are men – we want to change this through a combination of projects providing scholarships, internships and business grants. We are happy DMACC is our very first partner in this journey”. MFK seeks to address the barriers to the participation of women in the energy sector as employees and entrepreneurs. These activities are conducted through a series of proactive measures, such as paid apprenticeships, internships, and scholarships to support women’s employment in the energy sector. 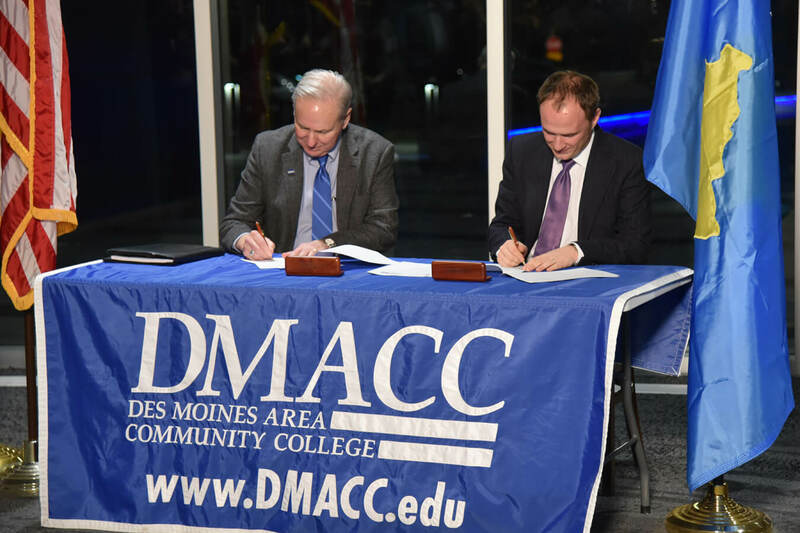 The signing ceremony was held at DMACC in Des Moines, in presence of high-level state dignitaries such as General Orr, Major General of the Iowa National Guard, State Senator Zack Nunn, and other distinguished guests from Kosovo and US. The event marks the beginning of the implementation of the MFK activity named Equal Economic Opportunities in The Energy Sector.